500km/h. After the ride, my comment is "It was more comfortably to take than an ordinary Shinkansen bullet train." Of course, I felt some shake at the beginning stage of a run because the train will be suspended by the wheel of tires, until the train will reach to 160km/h. However the train floats up by 10cm from the ground more than this speed, using the power of the superconducting liner motor. Therefore after exceeding this speed, the running train has been much stabilized. The speed of 500km continued for 8 seconds, but the run is very smooth and the train hardly shakes. I think this MAGLEV train is more stable than the present Shinkansen Nozomi bullet train, whose speed is around 250km/h. The trial ride finished in 25 minutes. On the way coming back to the base of the train, incidentally I felt some stimulation to my ears. I was explained that it may be because of the abrupt going down the slope of 300m, not because of the speed of 500km/h. Until I came and take this MAGLEV train, I misunderstood that the magnetism of the superconductivity should influence a watch or magnetic cards. I remembered that the old experiment line in Miyazaki line the guests were asked to do so. Therefore I left behind my watch, magnetic cards and magnetic tickets in my house. However, I entirely need not to worry about it. The present MAGLEV train is more advanced. We no more worry about the magnetism. The old train set the superconductivity coil on the ground directly. So the magnetism would affect to the passengers directly. However the designer of the MAGLEV train set the superconductivity coil on the sides and between trains. And that it was shielded from the magnetism, using iron blades. As the results, the magnetism in the cabin is at most about 10 gausses. I was surprised to know about it. I was surprised to see how compact sized the vehicles and the superconductivity magnet of the guide way on both sides of a track are. These compact instruments can create the superconductivity state, the temperature of 269 minus. Since absolute zero is 273 minus, it means that it is 4 degrees of the absolute temperature. No one could imagine such a low temperature would be made by these compact machines. This is my second surprise. The principle of propulsion is quite simple. A repulsive force and attractive force induced between magnets are used to propel the vehicles. The propulsion coils, installed on the side walls on both sides of the guide way, are powered by the three-phased alternating current electricity. The superconducting magnet on the vehicles are attracted or repelled by the shifting field. This creates the power to go forward on the vehicle. In short, the S pole and N pole of the superconducting magnet are attracted or repelled by turns to a guide way. Does it create such a big power to levitating such a heavy train of a few tons? It is surprising! I am wondering what would occur if coming and going trains in a speed of 500km/h would pass each other. They have already done a passing-each-other examination, which was carried out with the relative velocity of 1003km on November 16, 1999. The person in charge explained to me, "It finished within a second. He felt almost no turbulence, which we experience taking the Shinkansen bullet train. There are some difference between MAGLEV train and the Shinkansen bullet train. Firstly there is the guide way on the both side of the MAGLEV rail. Secondly going lane is far from the coming lane by s few meters. I had some technical questions to the doctor of engineering, who is the linear director-general in charge. He explained to me in details. (Q-1) How do you make a branch from the main road? (A-1) We move both sides of the guide ways at the same time, using traverse branch equipment, which cane move quickly. (Q-2) What would happen if this equipment stopped because of the blackout of the electricity? (A-2) In case of emergency, we can move it by hands. (Q-3) I am afraid that air resistance should be in a problem, because it levitates near the ground. (A-3) As you say, it is the biggest problem. If it was an airplane, which flies over the stratosphere, we would not be worried about the resistance of the air. However MAGLEV train is a vehicle to run on the ground is run at the speed of 500km. So we should develop some good devices to make the air resistance as smaller as possible. At first, we tried two types of shape of head. One type of head is double-cusp shape (the bill of duck). Another is aero-wedge shape (the nose of Shinkansen). After a few years' experiment, we have concluded there is nothing so much difference between these two types. As the next step, we introduced a very long nose, which we rode today. So far the length of nose was only 9m. But this new type has the nose of 23m. The problem of this long nose is slightly ill-shaped by favor. However, it was effective to eliminate the air resistance. On the other hands, the long nose would make the capacity of passengers smaller, which is also bad point. So if we would introduce the commercial vehicles, we would make the length of nose to half of this. (Q-4) As the operation will be done at the central controlling room, is a driver unnecessary? (A-4) Actually you are right. But there is a regulation on the driver. At least we need a conductor. (Q-5) What would happen if the electricity would stop suddenly? Will MAGLEV train fall down on the ground? (A-5) No, MAGLEV train would not fall down. It is levitating as usual, as long as the temperature of 269 minus will be kept. (Q-6) If so, how does the MAGLEV train would stop? (A-7) We have two kinds of braking system. One is an air brake while it runs in a high speed, which is a standing board. Another is the disk brake with a wheel at the time of a low speed. 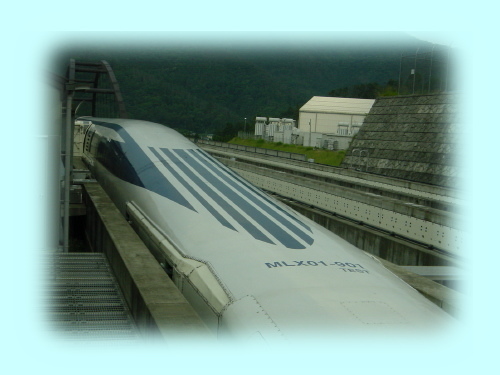 (Q-7) Does MAGLEV train need electricity? Under the situation without any pantograph, how do you get the electricity? (A-7) The MAGLEV train needs about 1/10 electric power of ordinary vehicles. Now there is the gas turbine of power generation equipment. However we are on the way of development, which enables us to get electricity by non-wiring system. (Q-8) Recently new type of superconductivity magnet has been developed. Can you make use of these developments? (A-8) It is true that these superconductivity magnets can keep the superconductivity situation longer. So far most of them are quite difficult for us to manufacture to lines. However recently this deficits are on the way of improving. We start using it. As I felt to understand mostly on the technical aspects, I had a last question to him, saying that you might be disagree with this thinking. Under the recent economic situation in Japan, to construct the third railway between Tokyo and Osaka, taking such huge money of seven or eight trillion yen could be impossible? My idea is to renew the present Shinkansen railway, by installing the superconductivity guide ways. You can make the construction during night time, when no train will run. By taking such method, we can make the present Shinkansen railway renovate to the most advanced superconductivity magnet train system. He disagreed with me and explained as following. Since the present Shinkansen railway is designed on the assumption that at most 300km/h, the minimum curvilinear radius of a track is 2,000m. On the other hand, the superconductivity magnet train is 500km/h, which required the minimum curvilinear radius of a track of 8,000m. That is the reason why we stick to a new railway. In addition, from the first, this plan foresees that the capacity of Toukaido Shinkansen becomes fully sooner or later. We have so far elaborated the second Shinkansen Plan, which combines Tokyo and Osaka within one hour. This is the basic and fundamental idea, to which we stick. Please think of the serious recession just after the bubble economy of 15 years ago. Japan has consumed 150 trillion yen for construction only. What was the result after consuming such huge amount of money? Nothing in particular. To compare with such unnecessarily consumed money, to take only one trillion yen for one year is quite a small matter. If we would continue spending one trillion yen continuously for seven years, we could finish construction of this superconductivity magnet train. He continued. Unfortunately at this moment, it would take almost triple of money to construct this superconductivity magnet train. However we continue to develop the technology for the cost-deduction. And that it would be after ten years for us to install the commercially running vehicles. During the coming ten years, our development would progress farther. So we have enough hope to do the cost deduction. Thinking the constructing the Shinkansen train system, There were several proposals to reduce the construction cost. The President of the Japan Railway at that time did not compromise. He stuck to build it as a new line and no crossing point. This is the beginning of the success of the Shinkansen line. I think that he is quite reasonable and persuasive. Needless to say, our Shinkansen railway is one of our most proud technologies. I hope it will be realized in near future.